In BYU Studies 48, no. 1, Morris Thurston writes about Joseph Smith’s most famous legal case: he was tried as an accessory to the attempted murder of former Missouri Governor Lilburn W. Boggs. Joseph’s trial caused quite a sensation in Springfield, Illinois, and newspapers far and wide gave the case headline status. Brian Cannon tells how Benjamin Cluff Jr., BYU’s almost-forgotten third president, made a significant impact on the university by expanding the faculty, raising academic standards, and helping the academy transition from a secondary school to a degree-conferring institution. Travis Anderson suggests in “Artistry and Aesthetics in Contemporary Mormon and Iranian Film” that if we Latter-day Saints were to judge our own movies against standout Iranian films, with reference either to their artistic quality or to their spiritual profundity, many of us would no doubt begin to wonder if the best “Mormon” feature films aren’t being made today by Muslims in Iran. Jill Mulvay Derr and Karen Lynn Davidson, editors of Eliza R. Snow: The Complete Poetry, share a handful of Snow’s more than five hundred poems along with historical context and insightful commentary. Even though book reviewers always mention the fact that publishing phenomenon Stephenie Meyer is a “Mormon housewife turned novelist,” Jana Riess finds it intriguing that they miss most of the LDS themes in her novels. In “Book of Mormon Stories That Steph Meyer Tells to Me,” Riess explores the theological underpinnings of Meyer’s popular fiction. BYU Studies 48, no. 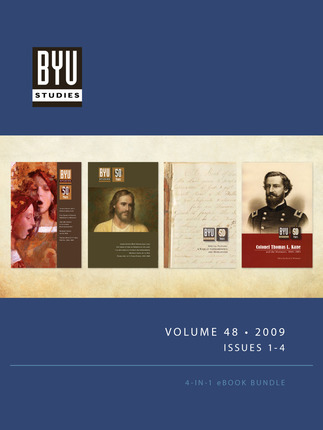 4, is a special issue featuring papers presented in a 2008–9 lecture series on Thomas L. Kane, sponsored by BYU’s Harold B. Lee Library. A son of a prominent Philadelphia judge, Kane came from a family that was well connected to the political and aristocratic powers of east coast America. In 1846, the governor commissioned Kane as a lieutenant colonel in the state militia, and he carried this title until he became a brigadier general during the Civil War.